After three chapters of history following The Well-Trained Mind protocol, I’ve decided to share what I think. We started with the Ancients as the book recommends. The basic formula is that you do three hours of history per week. The book gives you sample schedules of how to divide the reading and narration expected for each topic. We’re using The Story of the World: History for the Classical Child: Volume 1: Ancient Times, The Story of the World. Activity Book 1: Ancient Times, Story of the World, Volume 1: Ancient Times Audiobook CD by Susan Wise Bauer, and The Usborne Internet-Linked Encyclopedia Of World History as recommended by The Well Trained Mind. You can buy them through the Renegade Scholar Store. I decided to do 60 minutes of history three times per week, one chapter per week. Most chapters of The Story of the World Volume 1 are divided into two segments. Day One, we listen to The Story of the World on CD. We stop at the end of the first segment, write the narration and Kamikaze reads it back to me. We then find the location on the globe and map. Kamikaze colors the maps provided by The Story of the World Workbook. Then we read a library book that relates to the topic. Day Two is like Day One, except we listen to the second segment of the chapter and Kamikaze colors an illustration page from the workbook or draws a picture about the library book we read. Day Three we read from The Usborne Internet Linked Encyclopedia of World History, make a narration page and listen to both parts of that week’s chapter. Even though we listen to the CD, I still feel that having the text is useful for me. I like to read the chapter ahead of time and print out pictures for any unfamiliar things mentioned in it. I like this formula. It’s pretty easy to remember (that way you don’t have to keep referring to the book) and with each topic you are looking at four different sources (Story of the World, Usborne, 2 related library books). It’s good to see the material presented in different contexts and the overlap of some information is a good way of retaining the information without having to drill it. The Story of the World’s Activity Book is a great supplement to the text. With each chapter you get maps and coloring sheets as well as project ideas and recommended books. 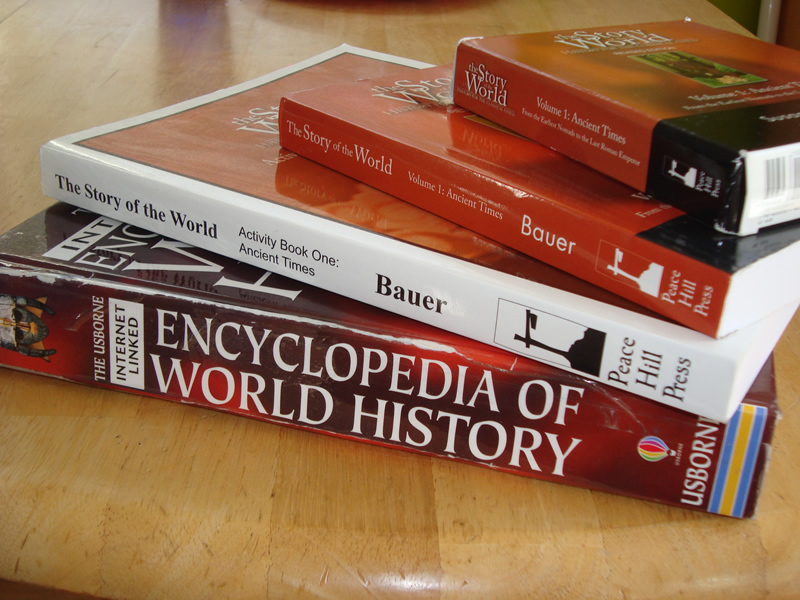 The recommended books come from two categories: additional history reading and corresponding literature suggestions. In fact, this book also provides you with questions as well as a narration sample so that you have a clearer idea what information is important to remember. For the hyper parents, such examples serve to remind them what they can realistically expect. The Activity Book even has review cards every four chapters. I’m quite pleased with this setup and Kamikaze likes history as well. However, he doesn’t really like the narrations. It takes effort but he does do well with them.